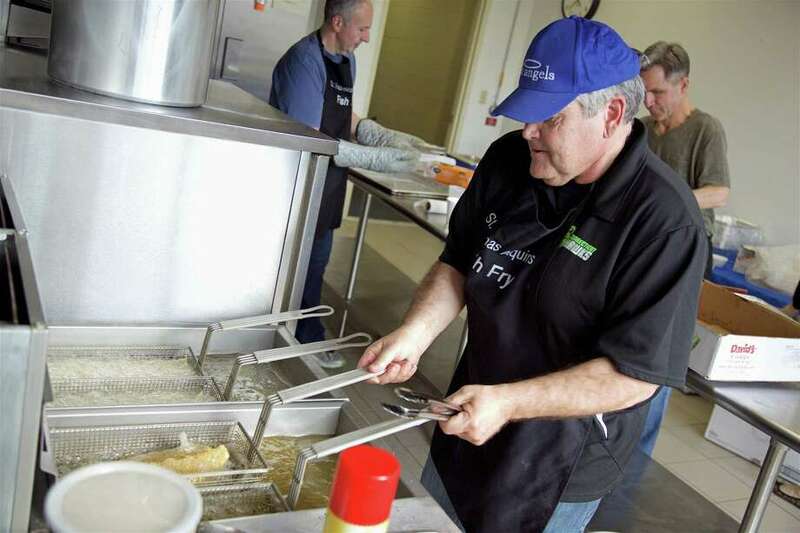 Greg Pierson of Westport works the fryer at the 7th annual Fish Fry at St. Thomas Aquinas Catholic School on Friday, March 22, 2019, in Fairfield, Conn. The Westport Weston Family YMCA will host a presentation about Piglet, the deaf and blind pink puppy, at 4 p.m. on March 31. Participants will have the opportunity to meet the puppy, and learn how Piglet’s positive mindset has helped him to overcome challenges. Recommended for children ages 7 and up. The Lustgarten Foundation’s Cocktails for a Cure event will take place April 4 from 7 to 9:30 p.m. at the Lucille Lortel White Barn Center at Westport Country Playhouse. All proceeds will benefit The Lustgarten Foundation, the nation’s largest private funder of pancreatic cancer research, and will help accelerate the path toward a cure for this aggressive, life-threatening disease. Admission includes light dinner from bartaco; wine, beer and a signature cocktail from Greens Farms Spirits; dessert; music; and a custom candy bar sponsored by Rosebud Boxes. Tickets and sponsorships are available. Admission is $100. The fundraiser will be open to the public. To purchase tickets or to join as a sponsor, call the Lustgarten Foundation at 866-789-1000 or visit events.lustgarten.org/event/2019-cocktails-for-a-cure/e224483. The Westport Historical Society is hosting a three-part historic brewing series beginning March 30. Participants will learn the basics of brewing with Full Moon Brewing brewer TJ Elgin as he leads the group through the brewing process. Hear more about the history of beer from the ancient Egyptians to medieval brewers. Learn the basics of brewing, before tasting a hoppy creation in session one. Series dates include, March 30, June 8 and Nov. 9. The first session takes place from noon to 5 p.m. Registration for the entire series costs $200 for members, or $210 for nonmembers. Price includes all materials for all three sessions. Reservations required; register at westporthistory.org or call 203-222-1424, ext. 5. Coleytown Company, Coleytown Middle School’s renowned theatrical troupe, presents its 2018-19 all-school musical, “42nd Street.” The troupe will hold four performances between March 29 and March 31. All shows will be performed at Bedford Middle School. Based on the Bradford Ropes novel and the classic 1933 movie of the same name, “42nd Street” tells the story of starry-eyed Peggy Sawyer, a naive small-town girl from Allentown, Pa. Peggy arrives in New York City, armed with tap shoes and big dreams. “Westport prides itself on theatre and theatre arts excellence. Despite a difficult start to the year, Coleytown Company students have risen to the challenge, and will ultimately present a production that doesn’t cut corners and sets the bar high,” said artistic director and CMS educator Ben Frimmer. There will be two evening and two matinee performances: March 29 at 7 p.m., and March 30-31 at 1 p.m. and 7 p.m.
Tickets are available at showtix4u.com for $15, plus a processing fee. A limited number of $15 tickets will be available at the door prior to showtime. Westport Parks and Recreation Director Jennifer Fava recently reminded reisdents of regulations related to animals on town property. Effective April 1, animals will not be permitted at Compo, Old Mill and Burying Hill beaches. Animals in or out of vehicles will not be allowed on any beach property, which includes all grass, sand and parking areas, as well as the roads within the beach area. This regulation is in effect until Oct. 1. “For the safety and well-being of the public and athletes, and to help keep ball fields in good playing condition, animals are not allowed on playing fields at any time of year. It is recommended that dogs remain on leash while on the perimeter of these town facilities. Also, while owners are welcome to walk dogs on leash on the road around Longshore Golf Course, animals are not allowed on the course at any time,” Fava said. The complete Westport Parks and Recreation Department 2019 Rules and Regulations can be found at www.westportrecreation.com. Westport Country Playhouse will host a 2019 season kickoff event on March 30 from 4 to 6:30 p.m., offering a fun atmosphere with food trucks and beer tastings. In addition, the Playhouse box office will be open during the event for special, day-of/in person-only ticket discounts. Admission is free and open to the public. Local food trucks, including Lobster Craft of Fairfield, Dough Girls of Greenwich, and Mama’s Food Truck of Stamford, will be on site with their specialties available for purchase from 4 to 5 p.m. Free beer tastings will be provided by Two Roads Brewing Company of Stratford and Bad Sons Beer Company of Derby. Two of the Playhouse’s restaurant partners — Westport’s Tavern on Main and Rizzuto’s — will serve complimentary dessert tastings. Wine, soda, bottled water, coffee and tea will be available for sale. Vendors are subject to change. Rain date is April 6. The Playhouse’s 2019 season runs from April 23 through Nov. 23, features five plays, including two musicals, two dramas and a comedy. The season will begin with “In the Heights,” from April 23 through May 11, followed by “Skeleton Crew” from June 4 through June 22, “Hershey Felder as Irving Berlin” from July 16 through Aug. 3, “Mlima’s Tale” from Oct. 1 through Oct. 19, and “Don Juan” from Nov. 5 through Nov. 23. For information and to buy tickets, visit www.westportplayhouse.org, call the box office at 203-227-4177, or visit Westport Country Playhouse. The Choir of New College, Oxford, one of the leading choral ensembles in the world, will perform in Westport at Christ & Holy Trinity Church on March 30. The concert is the last in the 2018-19 season of Music & Arts at Christ & Holy Trinity and the first of the choir’s U.S. tour. The concert begins at 5 p.m. in the church at Myrtle Avenue and Church Lane, and will be followed by a reception for concertgoers and performers in the Great Hall. Provision for a choir to lead and assist in chapel services has been an integral part of New College’s existence since its foundation in 1379, and despite major religious and constitutional changes during the past several hundred years, the choir remains a vital and much-loved component of college life and worship. In addition to services and concerts broadcast through the BBC, the choir has made over 100 recordings and tours widely. The Westport concert includes a selection of English cathedral music by Thomas Tallis, William Byrd, William Walton, Herbert Howells and many others. Under the direction of Robert Quinney, this ensemble of men and boys will bring to life masterpieces from a tradition over 500 years old. Organ solos will be presented by both of the choir’s resident organists. Tickets are $45 for preferred seats, $35 for adult general admission, and $10 for children under 18; in addition, family tickets are being offered at $80. Purchase tickets online at www.chtwestport.org/tickets. For more information, call 203-227-0827.